This project aimed to improve the quality of education at Van Han Lower Secondary School, by extending and renovating classrooms and improving outdoor space. This meant that the school could properly accommodate more than 500 children from the surrounding villages. 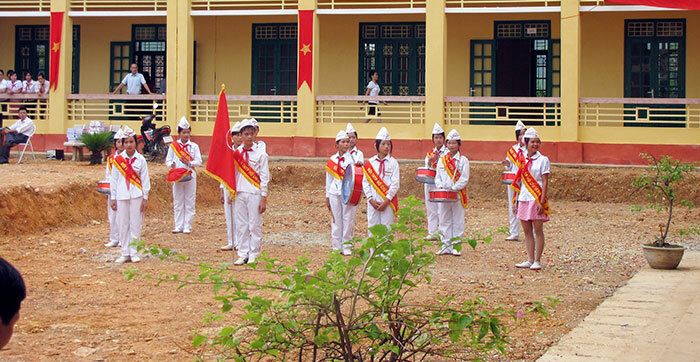 Like many schools in rural Vietnam, the lower secondary school in Van Han Commune, (Dong Hy district, Thai Nguyen province) simply did not have enough classrooms for the number of pupils. This meant the school ran a shift system, with half of the pupils attending in the morning and half in the afternoon. There was no time for outdoor activities and classroom facilities were in a poor condition. Rundown facilities were contributing to a drop-out rate of 8%, and 80% of the students gained only average or weak academic results. Due to degradation over the years, all of the classrooms of Van Han lower secondary schools were unstable and six rooms were regarded as being at high risk of collapse. This placed hundreds of students at risk on a daily basis. The school, community and local government did not have the resources to replace or improve the classroom infrastructure. Study Group’s Building Futures project, managed by experienced NGO Plan International, involved the construction of 10 new classrooms. The aim was to improve the learning environment of the school, and also to promote outdoor activities and allow the children to develop both physically and mentally. Built 10 new classrooms in a two-floored building. The large windows make the classrooms bright and ceiling fans ensure students are kept cool during lessons. We also built an anti-thunder storm system to further protect the school from natural disasters. Supported the community, in meaningful community development projects, with joint responsibility, ownership and management. Thanks to Study Group’s support, the students and teachers are now protected from natural disasters such as strong storms and heavy rains. By improving the infrastructure, supplying the school with a much needed water and sanitation system, and building a protected outdoor space; Study Group has improved the learning environment for hundreds of students over the last few years. Not only is the school safer, but the addition of the outdoor space has meant that children can enjoy school through playground activities and outdoor learning when appropriate. Completed in June 2010, the improvement of facilities means that lessons are no longer conducted in two sessions. Afternoons can be used for outdoor activities, such as exercises, sport and games, which support the physical development of the students. In addition, supplementary teaching can be provided to those whose learning abilities are weaker, which helps them develop further. Since the completion of the project, enrolment numbers have increased from 453 to 541. Having been certified as national standard in 2012, the school’s student population has continued to soar; from 362 in 2012-13 to 476 in 2016-17. The school has been recognised for its efforts and achievement in reducing illiteracy, promoting education and maintaining strong professionalism. The figures speak for themselves; there is now 100% attendance at school, with no dropouts. I want to study well, and become a pilot in the future.